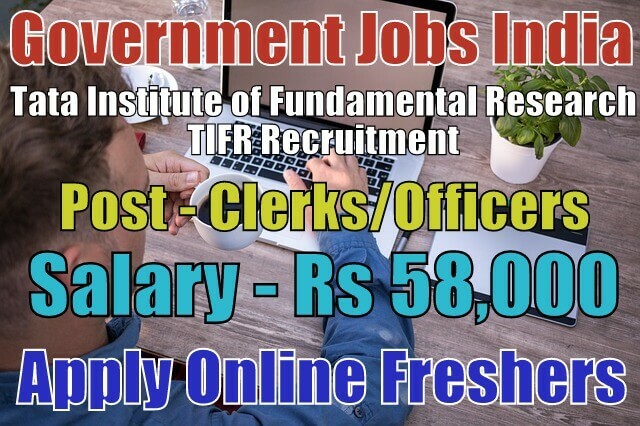 Tata Institute of Fundamental Research TIFR Recruitment 2018-19 notification (Ministry of Social justice and Empowerment) for 07 project scientific officer and clerk posts. All legible and interested candidates can apply on or before (17-11-2018). 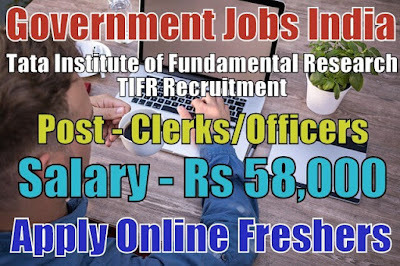 Further information about the Tata Institute of Fundamental Research recruitment courses and exams, vacancies, salary details, TIFR careers, application fee, educational qualifications and all other details/ information about these posts are mentioned in detail below. The candidates can be located anywhere in India for service. The total number of vacancies are 07. Name of Vacancies and Number of Posts - The name and number of vacancies per post are mentioned below. 7. Project Clerk - 01. Salary/Pay and Grade Pay - For posts (1-5), the payable salary will be Rs 71,000, for project scientific officer (detector) post, the payable salary will be Rs 58,000 and for project clerk post, the payable salary will be Rs 28,000 per month. Further information about salary details is mentioned in the detailed advertisement. Age Limit - For TIFR recruitment, candidate age should lie between 18 - 28 years. To know more about age details as post wise, click on the detailed advertisement. Educational Qualifications - Candidates have done 10th (matriculation), 12th, B.E./B/Tech in computer science/ information technology or its equivalent/relevant/higher qualification from a recognized board or university. To know more about educational qualification details, see the advertisement. If you are not graduated then, click here for 10th and 12th based jobs. Selection Method - For recruitment in the Tata Institute of Fundamental Research, the candidate will be selected on the basis of their performance in the personal discussion and then personal interview. Candidates must be prepared for these tests. Work Experience - No further work experience required for posts (6,7). Fresher candidates and candidates with no experience can also apply for these posts. How to Apply - All legible and interested candidates have to apply online from the official website www.tifr.res.in/ or from the given link below. Candidates have to take a printout of applied application form. After printout, candidates must send the application form along with needed / relevant / required testimonials(which is mentioned in detailed advertisement) superscribing the envelope "Application for the post of 'Name of Post' " to the given desired address. Last Date for Submitting Application Form - All candidates must apply on or before (17-11-2018). After the last date, no application form will be submitted. Application Fee - There will be no application fee for any category candidates. Regular employees of Tata Institute of Fundamental Research TIFR applying for the higher position are too not required to pay any application fee. Important Note - Application forms received after due date will not be entertained under any circumstances. Incomplete or late applications without enclosures will summarily be rejected without any reasons and correspondence. Therefore application forms must reach before the last date. Belated/Incomplete applications are liable to be rejected. Copyright © 2015-2019 | Government Jobs India - Jobsgovind. Powered by Blogger.